Multiple Form Shapes: Enable the operator to produce multiple product lines. 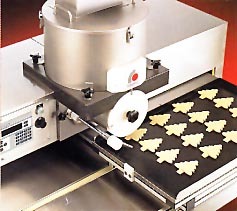 From the traditional shortbread square to festive Easter Bunnies or Christmas Trees this unit caters to every season. 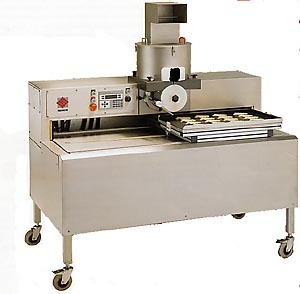 Versatile Production: The machine's ability to handles mixtures of varying textures or consistencies allows the operator the freedom to switch from mixtures such as Chololate Chip Cookies, to Crepes, to Gingerbread, in a matter of moments. Accurate portion control: The depth of the form shape can be easily adjusted from 3mm to 34mm, insuring that the required weight is readily obtainable. Automated Traying System, w/Simple programming: The unique automated traying system provides the solution to the increaded production effeciencies, and improved product quality. Tailored to the dimensions of every product, a simple production program ensures that each form is positioned accurately on the baking tray. On completion of the production cycle, the baker is presented with a fully filled tray in preparation for transfer to the oven or storage facility. With the next tray in position, the production cycle can be reinitiated, allowing the baker to achieve output of up to 3000 form per hour. Improved product quality: In addition to saving valuable production time, the baker is able to reduce product handling during the production process, noticeably improving the quality of the end product.